Photos coming soon. Hopefully Putz-In-Boots will add her photos sooner. I've planned trips to Ingalls Creek for decades. I just never made it. For the middle day of Memorial Day weekend I had hoped to head to the desert for a batch of wildflowers. 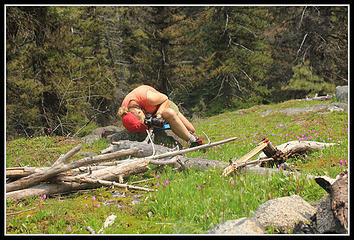 Unfortunately a chance of thundershowers did not sound like conditions to climb up on open ridges. A forested valley sounded better. Janet joined me and she had not hiked there before either. We met in Bellevue at 6:55 am and headed east. We headed up Highway 97 to Blewett Pass and 13 1/2 miles farther to Ingalls Creek Road. A short paved mile brought us to the trailhead. There were more than a dozen cars there when we arrived at 8:50. By 9:00 am we were on the trail. It was warmer than I expected. Short sleeves were the story of the day. Wildflowers began on the road in and never stopped. Balsamroot and lupine in the lot before we took a step. 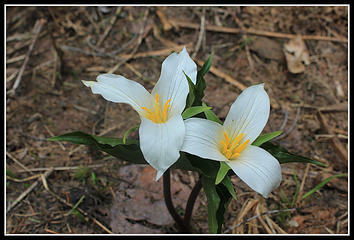 Trillium were the stars of the day but many other flowers were blooming in profusion. The trail varies from right along the creek to high above. It is always in ear shot and very noisy when close by. Spring snow melt has it really roaring. There are a number of small side creeks to cross. Most are step across or a rock or two in the middle. Only one required crossing on a narrow log to keep boots dry. The neat part of the hike was the slowly changing conditions. First we saw pink trillium way past their peak. Farther along and higher they were at their peak. Near our turn around point they were just beginning to open. 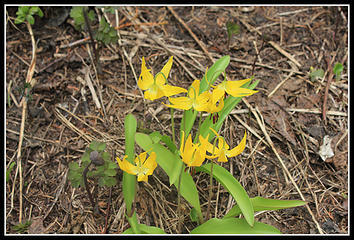 Same with glacier lilies. 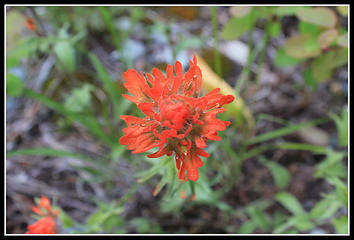 The Indian paintbrush was out in profusion. Red, orange, and some yellow. Really vibrant colors. For the most part it was overcast with a number of patches of sunshine. Overall pretty good lighting for flower photos. 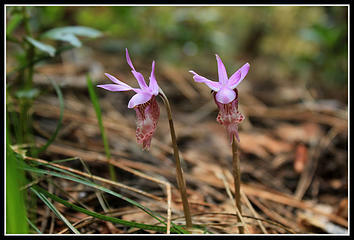 I saw more calypso orchids on this hike than any other. Groups of 2, 3, and even a dozen at a time. We saw so many trillium that we discussed what to call a group of 50 or more in one place. A cluster? A flock? We couldn't decide so just decided to call them cluster flocks. If you like trillium this is the hike and this is the time. There are a lot of campsites along the trail. After the first mile or so they were mostly taken. Some right along the trail and some a short way off on a side trail. Lots of happy backpackers this weekend. The trail climbs slowly and steadily with a few short steeper spots. Overall it is easy to keep up a fast pace. 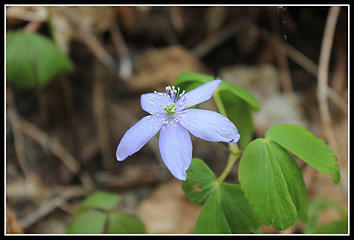 Unless of course, you are stopping every few minutes to admire and photograph more wildflowers. As we hiked along we saw vanilla leaf, false solomon's seal, yellow violets, buttercups, lupine, currants, and more in bloom. At times we had views up to peaks of the Stuart Range on one side and the Teanaway on the other. Because the grade is so gentle the miles fly by. Most folks probably go farther than they think. I was surprised to see several groups going as far or farther than our 7 miles up the valley. The gentle grade also masks the elevation gain. My GPS recorded a little over 2200' or gain including ups and downs. 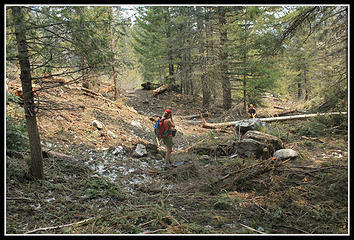 I read a trip report from the previous weekend mentioning 30 trees down and a section of trail obliterated by an avalanche. Things have changed in just seven days. At 5 2/3 miles we reached the avalanche. A crew was working to clean it up. They sawed out all the downed trees. The trail is buried under many feet of dirt covered snow/ice and rubble. We followed footsteps up and over the heap. On the far side the trail is back by the river. Head that way and pick it up again. There is a camp there and a number of tents were set up. At about 6.30 miles we reached Falls Creek Camp. A big camp area with lots of tents. A little before the camp we saw the top of a big waterfall across the valley. Now I can see why it's called Falls Creek. We dropped to the riverbank and found a log that does cross the river. It is wet and near the water level the last five feet. Steady nerves are needed for the crossing. On the north side we began to see up to several big waterfalls. Open meadows allowed for views up. 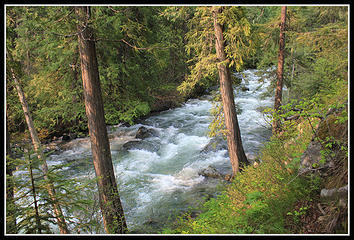 The reason for the meadows are the avalanches that sweep down these creek valleys. Just beyond 7 miles we stopped for a late lunch. This was our turn around point. We crossed a few small snow patches but it was still snow free at 7 miles and 3600'. Across the valley from us most of the trees on the steep hillside were now larch. Very pale green with their new needles. A lone larch was near us. It was already 1:20 when we stopped. It had warmed as the day went on and was very comfortable in short sleeves even at rest. As we were getting ready to head down Janet noticed purple farther up the slope. We climbed up to discover a wealth of shooting stars in bloom. 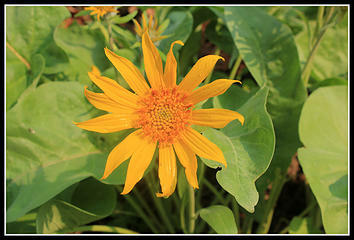 That is one flower I had not seen so far this year. Some buttercups and yellow bells were mixed in. More photos ensued. It was almost 2:00 pm when we finally did head down. 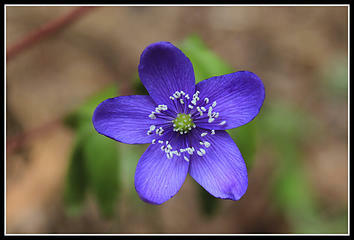 At about 6.8 miles we saw a cluster of the bluish purple flowers I saw the week before along the Yakima River. These had a more vibrant color. The rest of the way back was much faster. We did take photo stops but many fewer than on the way in. We saw several groups of backpackers heading out. There were a lot of people on the trail but not as many as I expected. It was never crowded. As with any 14 mile hike the last few miles seemed to take forever. We chopped about 1 1/2 hours off our time coming out. By 5:00 pm we were back at the car. Traffic was not too bad as it was the middle day of the three day weekend. Monday would be much different. By 6:55 pm we were back at the park and ride in Bellevue. The mostly sunny day predicted for the Seattle area did not seem to pass. At least in early evening it was dark and cloudy. It rained on and off on the drive home making our warm and partly sunny day on the east slopes seem that much better. In hindsight we seemed to hit this trail right at the perfect time. Fantastic flowers, roaring creek, easy creek crossings, and not all that crowded. This will not be my last visit. 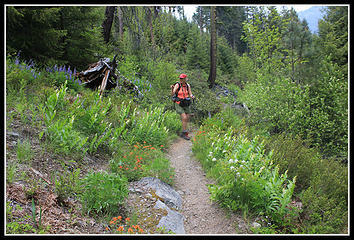 How far is the trail snow free or did you ever even run into any snow? Thanks for your TR, might have to plan a backpack trip through there. Wonderful flower pics. I can feel the sun on my back from a collage of different trips just looking at them. Nice! I like the flower pictures, too. Mine always come out blurry and I never know what they are anyhow. Thanks for sharing I really enjoyed your pictures. This upcoming weeknd sounds great so I will be over there enjoying it too. Gorgeous photos! How were the bugs? Ticks? I'm looking for a good overnight for us this weekend, and have never been to Ingalls Creek. My son is young, and skeeters can make/break his good time. And I need something easy & short for awhile - sounds like this might fit the bill perfectly. I've added some of my photos and a link to the rest in the first post above. Also, we did not see any ticks. There were a few mosquitoes but only a few. Not really a problem yet. I like yer bug pitcher. 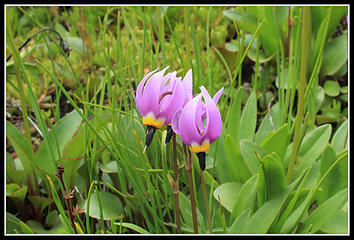 It is a great trail, and you certainly captured the beauty of the flowers. Gotta go... gotta go... Thanks for the wonderful pictures. Yea looks like now is the time for my annual trip. I was thinking there might be snow still up there since I typically went in June but it looks pretty good right now. Hopefully Thursday or Friday or on the weekend.